Rumors are flying once again that Apple is due to release a 15-inch version of their popular MacBook Air ultra-portable notebook, after a "premium Mac dock maker" detailed the plans to Electricpig at this week's CU Exposed show in London. The launch would pressumably happen next month. Whilst the vendor chose to remain anonymous, looking at the show's exhibitor list it is likely to be Henge Docks, according to CNet. They supply docks for both the Air and Pro range of Apple's MacBook notebooks. It’s not the first time rumors have been aired regarding Apple releasing a larger MacBook Air, but to hear it from a "premium Mac accessory maker" adds some weight to the argument. The vendor even went as far as to suggest the rumored model would "effectively (kill) the (MacBook) Pro for the average consumer." They also felt that the iconic US firm planned to remove the MacBook Pro 15-inch versions replacing them with the new "Air" versions, leaving just the 13 and 17-inch models carrying the MacBook Pro badge. That said, both ranges currently feature 13-inch notebooks, so it’s entirely possible 15-inch versions could co-exist should the rumor prove to be correct. 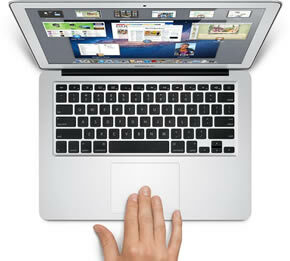 With the Ivy Bridge range of processors due for release next month we will likely see model refreshes to the MacBook Air and Pro lines. There have been a substantial number of rumors over the past year though, so at this point it is not entirely clear exactly what the Cupertino-based firm’s plans are. Also, given the very secretive nature of Apple, and how closely they guard new product releases it’s unlikely we will know what route they take until they are announced. As expected with news of this nature, Apple did not respond to any requests for further comment.